Modelling the function of a light switch in code is simple enough. It has an On state, which we could call 1 (or a very small cup with an electron in it). And there’s an Off state, or 0, or an empty cup. So, that’s not a lot of binary data. But what if it’s a dimmer switch? One’s cup may be neither full nor half empty. We’ve a theoretically limitless amount of On-ness (or Off-ness) to deal with, which requires an infinite amount of code. And that’s where coders start making compromises, balancing the accuracy of the model against the resources required to render it. With soft synths, there’s the added complication of ensuring the model works in real time, producing audio on the fly. Now look at all the dimmer switches (aka knobs and sliders) of an analog synth, each offering infinite opportunity to arrive at software models that’d send even Deep Thought into a sulk. In devising a workable virtualisation, developers compromise detail to ensure that an average computer, running a DAW and other plugins simultaneously, can cope and that one's cup runneth not over. In other words, so that clicks and pops do not start popping up as the system voices complaint. It’s precisely this compromise that developer U-He hasn’t elected to take with 32/64-bit, VST/AU, Windows/OS X synth plugin Diva. 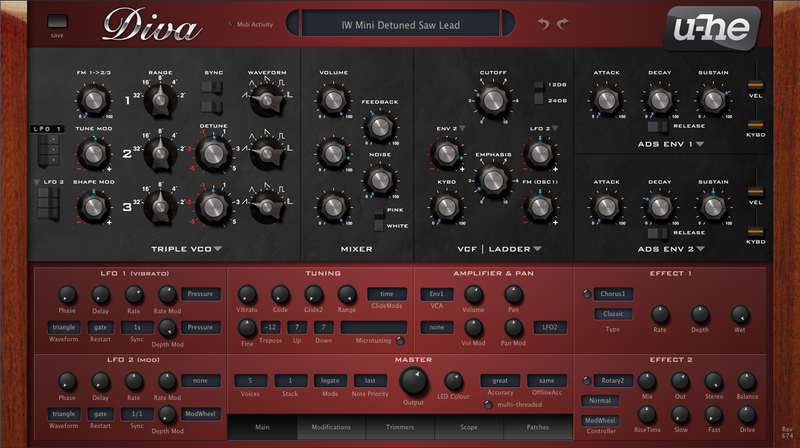 Rather than catering to people with so-so systems, Diva employs the kind of code found in industrial circuit simulators in a reach for true analog authenticity. Its name, allegedly an acronym of Dinosaur Impersonating Virtual Analogue, is apposite. Wetware divas can be demanding; refuseniks if everything isn’t focused on them; locking up or falling over in a sulky funk if their needs are not met. No popping or crackling, but hissy-fitting and hurling personal grooming accessories at personal assistants. However, when they're in the limelight, how they do perform, sounding anything from heart-pangingly pathetique to oxytocin-agonisingly awesome. The launch of Diva 1.0 didn’t set the world afire – one UK print publication, while pointing out that her demands weren’t as overpowering as the marketing spiel suggests, seemed to show mild indifference to her prowess. Pretty impressive, and US mag Keyboard.com was quite in accord with MuzoBlog findings when evaluating Diva 1.0 - read all abaht it here (PDF). 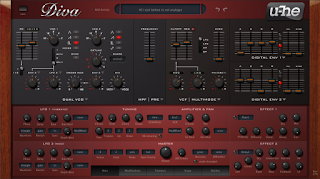 Part of the reason for mixed reviews on launch (CPU-hammering issues aside) may have been that, while great effort has been taken to accurately model analog synth technologies, Diva is not a model of a specific analog synth. U-He has taken elements from a variety of classics and created a monster that has never physically existed. If it had, such a beast would likely have trounced everything on the market, cost a fortune and made many Tangerine Dream roadies redundant. The purpose of this post is not to re-review what’s already been covered extensively elsewhere - just Google and see. If you want full and extensive gen detailing what’s on offer, then RTFM (which is print-magazine technical helpdesk phone-in-day speak for ‘read the manual’ (PDF), a document that's been revised for v1.1 to pack in more detail and tutorials). 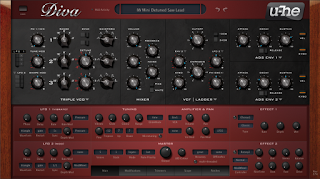 If pushed for time, visit Diva's product page, also updated for v1.1, which offers an overview and access to some tunes in which Diva features prominently. There are also the entries for KVR Audio's One Synth Challenge #35 which, as the name suggests, features compositions made with just one synth. See if you can guess which. Nice, eh? While this 0.1 update (free to registered users) is billed as requiring 40% less CPU than the original, there’s a point to be raised. 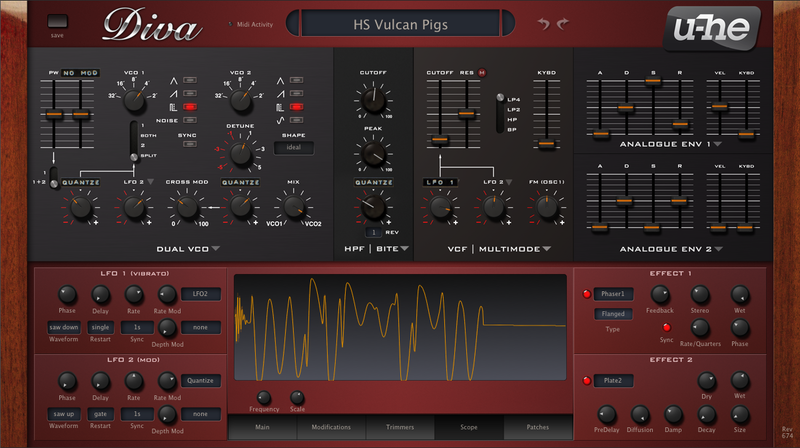 First, let it be known that v1.0 wasn’t outrageously heavy on system resources - heavier than a good few synth plugs, but not a system blitzer. Also, it’s actually quite difficult to verify a claim of 40% off. At MuzoBlog, heavy-duty software is fed to the array of networked machines called the cacophone, regardless of how it’s configured from one day to the next. There’s no way it’ll be hobbled when testing how few resources will support a given synth. Sure enough, the cacophone gobbled up Diva and just sat there, thinking. (It's disturbing when it does that.) But, to the point. If you’re even a wee bit serious about making music with modern technology, you won't have an average computer. 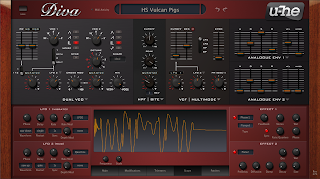 You'll already be equipped with a system that’ll handle a sequencer, the Diva plug (there’s no standalone option), other synths and a good helping of plugin processors. No, a bargain machine from PC World, or similar domestic-tech retailer, will not do. Multi-threaded, fast processors, 10s of GigaBytes of RAM, TeraBytes of storage, a dedicated audio interface (USB 2.0 connectivity minimum - Thunderbolt tops) and more than one monitor screen are the baseline for meaningful audio production ventures. Our refreshed Diva, faced with a multicore system toting on-CPU memory interfacing, will now sound as many voices as required, which is a step forward. 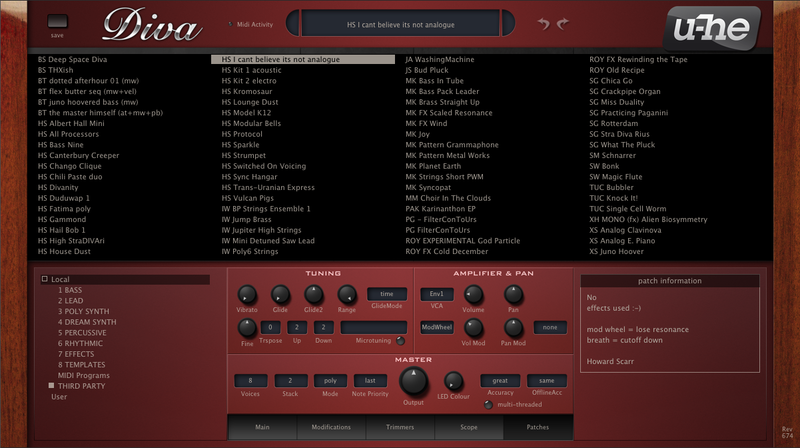 Also, stepping backward, some users found that beta versions sounded brighter than release version 1.0. So, a little reverse engineering has cleared Diva's throat and she's back to her young self once more. Try a test drive with either the Mac or Windows downloadable demo to see whether she's worth your wedge. 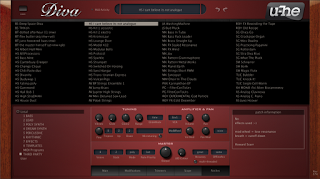 If, after having broken the bank buying a proper computer, you’re left in need of realistic analog timbres, you'll find Diva the ideal source. No, she doesn’t emulate a particular olde-worlde hardware synth. 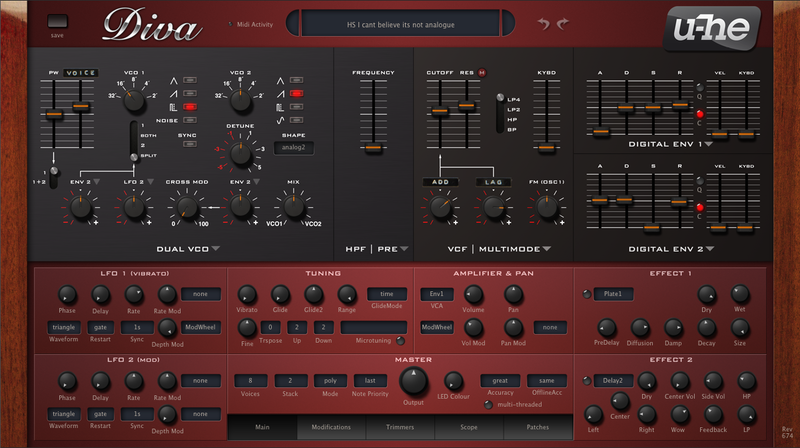 She is a virtualisation of the best bits of many of them (minus an arpeggiator), plus an oscilloscope for good measure. She pumps out sumptuous sonics with gusto, is incredibly versatile while being easy to control, her modular implementation means you can create mutant offspring, and there's slick MIDI learn to further PSpice up performance (bit of a circuit sim programmer’s joke there, ahem).